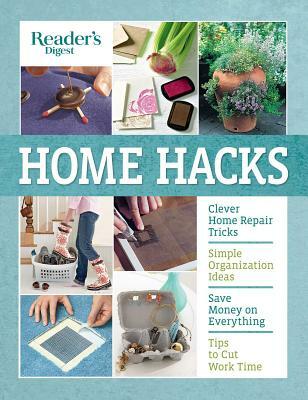 Discover the hundreds of practical Do-It-Yourself home improvement and household hacks to simplify everyday life. Tired of spending your free time managing your home? Looking for ways to streamline your chores while saving time and money? In Home Hacks you’ll find clever DIY tips and tricks to do just that. Whether you are looking to organize your space, find simpler ways to clean including natural cleaning solutions, create systems to keep things tidy, keep your clothes in tip-top shape, or know which hooks are best for wall hangings, here you’ll find the smartest hacks to everyday problems. Try these hundreds of easy, quick, and efficient techniques to start implementing right away. From using a blow dryer to make dusting a breeze to whipping up an under-the-bed storage unit with items you already have, there are ideas for every need. Kitchen advice from the heart of the home to simplify and enjoy meals. Organization tips for the home, computer, office and even you. Clear the clutter with advice to tidy every room in the house. Cleaning know-how to make the whole house sparkle using products from your cupboards. Home decorating ideas offer best choices from paint colors to inexpensive updates. Take care of what you wear including closet tips, stain removal, and clothes and shoe care. Additional, sometimes surprising, hacks are peppered throughout the pages with Easy Fix, Save Time, Save Money, Insider Tips, and Expert Advise quick-tips boxes. Finally learn the clever ways to tackle the chaos and get your house in order! The Reader’s Digest Association, Inc. is a global multi-brand media company that educates, entertains and connects audiences around the world. It publishes 92 magazines, including 50 editions of Reader’s digest, the world’s largest paid-circulation magazine. With a rate base of 5.5 million and more than 32 million readers, Reader’s digest is the largest magazine in the country.